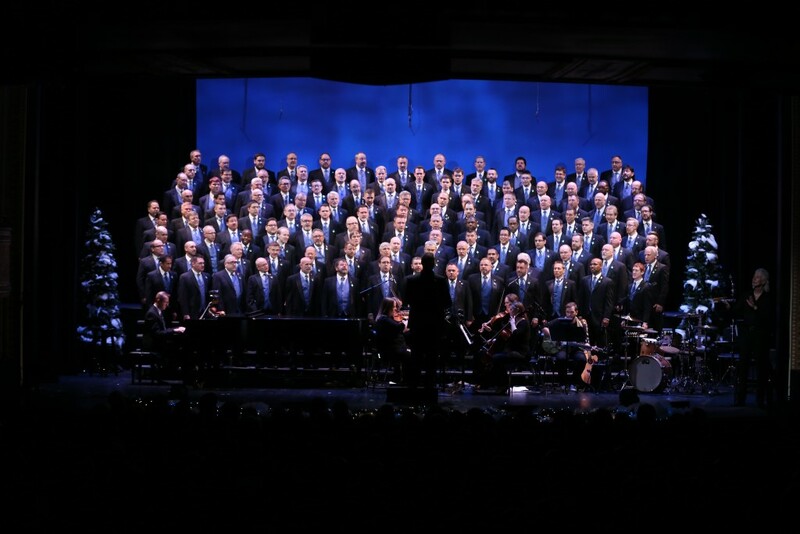 This past weekend, the Heartland Men’s Chorus was joined by special guests the Twin Cities Gay Men’s Chorus, and speakers Morgana Bailey and Jane Clementi in their spring production at the Folly Theater titled “Identify,” featuring the Midwest premiere of “Tyler’s Suite,” and emotionally-charged themes of anti-bullying and acceptance. In 2010, Rutgers University freshman Tyler Clementi took his life at the age of 18 after becoming the victim of cyberbullying regarding a private sexual encounter made public without his consent. This is, however, only a single example of cyberbullying within the LGBT community, which is committed by persons of various ages, races, sexual orientations, religious and political affiliations, etc. As a response and with efforts to raise awareness of bullying, composer Stephen Schwartz—known for his Broadway works including Pippin, Godspell, and Wicked—gathered a group of composers to create the nine-movement choral work Tyler’s Suite. In collaboration with the Twin Cities Gay Men’s Chorus, the Heartland Men’s Chorus gave the Midwest premiere of the large work this past weekend at the Folly Theater. For this concert event titled “Identify,” speakers Morgana Bailey and Jane Clementi were also present for a heartbreaking and inspirational production that addressed the concepts of bullying, identity, and love for all in an emotionally memorable way. More commonly known for his classical output, Norwegian composer Edvard Grieg wrote the folk song “Brothers, Sing On!” which was first performed in 1883 and has since grown in popularity with glee clubs and men’s choruses. As the opening number, this song acted as a great demonstration of the combined choirs’ powerful and beautiful sound, greeting the audience “with glad and open hearts.” Tyler’s Suite followed, and brought with it an immediate shift in mood. A talented violinist, Tyler’s musical voice is represented by a solo violin in the opening of the work, performed this weekend by Dr. Michalis Koutsoupides. Although his sound was lovely, Koutsoupides played the opening material, composed by John Corigliano, in a manner that lacked a musical connection of phrases, often resulting in disjunct chunks of music that didn’t feel related to one another. The work continues to tell the story of Tyler growing up interested in the unicycle and leaving for college, including numbers based on numerous interviews with Tyler’s immediate family. Standout numbers include Craig Carnelia’s “The Unicycle Song,” which featured the youthful enthusiasm of soloist Daniel Alford and impressive juggling and balancing feats on an actual unicycle by another performer. Michael L. De Voe was resonant and emphatic as Tyler’s father in “Just A Boy” by John Bucchino, while Nancy Nail brought still emotion to the stage as Tyler’s mother in the 11 o’clock number “I Love You More” by Ann Hampton Callaway (arranged by Tim Sarsany). In the closing movement, “The Narrow Bridge” by Jake Heggie, soloist Michael Schnetzer sang with great ease and stunning beauty, and this reviewer wishes there were a bigger role for him in this production. After the performance, Jane Clementi, Tyler’s real-life mother, spoke of her son’s life and legacy through her personal work and the work of the Tyler Clementi Foundation, seeking an end to “online and offline bullying in schools, workplaces, and faith communities,” according to the organization’s website. While much of the music is forgettable after a first listen, this work packs an emotional punch that lasts long after the music ends while serving a valuable purpose in the fight for acceptance and equality. As the guest chorus, members of TCGMC, under the direction of Dr. Ben Riggs and accompanied by Timothy De Prey, presented a short program of songs that highlighted their fantastic blending capabilities. Numbers for the full chorus, Kin by Timothy C. Takach and Our America by Ben Allaway, were simple and to the point with regard to the lyrics, fitting for the production’s overarching theme. The TCGMC Chamber Singers were wonderful, singing Shine by Timothy Snyder with enthusiasm and exceptional sensitivity to the music, great pitch accuracy, and beautiful uniformity within parts that combined for a marvelous chamber sound. With Robert Lamar Sims at the piano, HMC and artistic director Dustin S. Cates began their portion of the program with sonic strength in Dan Forrest’s The Music of Living, though some of the nuanced dynamic changes could have been more pronounced for a greater effect. While their other pieces were performed well and with good musicality, the lyrics of You Have More Friends Than You Know were a little trite and forced, though appropriate for the program’s theme. During transitions between choirs, Morgana Bailey spoke of her life and the struggle many feel to expose their true self in all aspects of one’s life. Based in Kansas City, she garnered international attention with her 2014 TED Talk “The Danger of Hiding Who You Are,” which has since been viewed almost 2.6 million times. Quoting Toni Morrison, Bailey agrees that “there are more scary things inside than outside,” and that vocalizing one’s individual differences may release a person from the power and fear held over them. viewed before a more cheerful departure from the theater.